It was an emotional final day at Royal Windsor Horse Show as the crowds took to their feet to witness Show Jumping legend, Nick Skelton and his gold medal winning horse, Big Star, stand together in the arena for the last time. In front of Her Majesty The Queen and packed out grandstands, Skelton was joined by his family, owners, fellow Team GB riders and loyal groom, Mark Beaver, to say his final goodbye. There was not a dry eye in the house as Skelton dismounted Big Star, took the saddle off his back – a long standing tradition when a horse is retired – and walked a final lap of honour in-hand to a standing ovation, with the crowd cheering to mark their respect and admiration for Skelton, whose career spanned five decades. With a final wave to the adoring crowd, the Olympic gold medal winning duo exited the arena to start their well-deserved retirement. The pinnacle of Royal Windsor Horse Show, the much-anticipated Rolex Grand Prix, did not fail to disappoint. With 30 World class riders lining up to win over £254,000, the competition was hot, and Bob Ellis’ 1.60m course reflected the high standard. Four-time European gold medalist, Michael Whitaker was the first to jump clear aboard JB’s Hot Stuff, with whom he won the Antwerp Grand Prix last month. He was in good company as the likes of World No. 1 Kent Farrington, last night’s winner Jessica Springsteen and Olympic gold medalists Scott Brash, Laura Kraut and Eric Lamaze followed suit. The jump-off had the packed crowds on the edge of their seats as 12 riders came forward to compete for the £63,000 first prize. When Britain’s Guy Williams came in to the famous Castle Arena as second to go, jumping clear in a time of 43.45, it looked like his time would be hard to catch; however, with the best riders in the world to come nothing was certain. Jessica Springsteen rode a fantastic round, taking a flyer to the up-to-height Bahrain oxer in front of the Members Enclosure to make up valuable time and momentarily took the lead; however, with Kent Farrington next into the arena, her lead did not last long. The defending champion made the tightest of turns to the tricky Tower Bridge water tray and pushed on throughout to knock over three seconds off the previous leader’s time and lay down the gauntlet to his competitors. World No. 4 Eric Lamaze flew round; however, he took one too many risks and paid the price finishing with four faults, albeit in the fastest time of the day. Home favourite Scott Brash, riding his talented mare Ursula XII, put up a good challenge much to the crowd’s delight, to finish in third, and Lorenzo de Luca and Halifax van het Kluizebos secured second as last to go, but it was only Kent who managed to break the elusive 40 second barrier, proving why he’s the best in the world. Earlier in the day, the Palm Speed Stakes saw competitors jumping one round against the clock for a total prize fund of £23,300. The twelve-fence course proved tricky, with a double of verticals down the last line catching many of the riders out. The first clear came from Switzerland’s Pius Schwizer, who jumped a deceptively quick round to set the pace for those that followed. The always competitive Schwizer, riding Leonard de la Ferme CH, posted a time of 61.47 seconds, which proved hard to match. Several riders came close, including Tiffany Foster with the eleven-year-old gelding Brighton and Laura Kraut with Whitney, already winners in the Castle Arena this week; however, their rounds were only good enough for third and fourth positions respectively. However, it was Billy Twomey, towards the end of the draw, who managed to clinch victory aboard Sue Davies’ grey gelding Tin Tin, shaving 0.65 seconds off Schwizer’s time. The Irishman took advantage of Tin Tin’s big stride to make up time between fences and made all the turns required to top the leader board. Boyd Exell scored his eighth win in the Land Rover International Driving Grand Prix, having taken his first title in 2004. After a good win in the dressage phase with his team of four mixed Dutch and Swedish-bred horses, the reigning World Champion from Australia drove a steady round, mindful of a young horse in the wheel competing in his first marathon. Second in this phase, by less than one penalty point to his pupil Edouard Simonet from Belgium, he nevertheless retained the top slot overall. A long technical cones course set by Johan Jacobs from the Netherlands, that was challenging yet fair in the final phase, saw few drivers manage double clear rounds. Exell was one to have a cone down, but he secured the title 13-penalty points ahead of his closest challenger. Simonet, driving a team of impressive Arab cross Friesian black horses, moved up from third into second place in the final ratings, while Koos de Ronde from the Netherlands, seldom out of the top scoring teams, finished third. Horse Pairs found the cones course no less of a test, and again, fortunes behind the leader changed. Germany’s Lars Schwitte led through the first two phases, even though he scored fourth place in the marathon, and with just one cone down in the final phase, he retained his overall first place. A driver who pursues the sport purely for pleasure – he manages his own construction company – and who was competing for the first time here, he was understandably delighted with his result. Behind him Michael Sellier from France, competing for the first time at Royal Windsor, moved up to second place from third, while Gerald Rossler from Austria jumped two places to clinch third. There were numerous changes in the final standings in the Pony Four-In-Hands section. Jacqueline Walter from Germany had squeezed into first place after the marathon by the narrowest of margins, but the overall win went to the only competitor to post a double clear in the cones, Tinne Bax from Belgium. 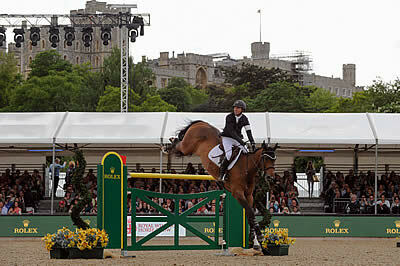 Bax has competed at Royal Windsor for the last half a dozen years, but this is her first win. Her smile showed just how pleased she was. Walter, smiling equally as broadly, pronounced herself completely satisfied to have come second at her third time competing here – she has improved her position each time – while six times Royal Windsor winner, Jan de Boer from the Netherlands, dropped to third place. In a team competition among Horse Fours competitors – the Netherlands took first place with Ijsbrand Chardon, Theo Timmerman and Koos de Ronde. Belgium was second with Edouard Simonet, Dries Degrieck and Glen Geerts, and Germany third with Georg von Stein, Mareike Harm and Rainer Duen. Fourteen high-class contenders of all sizes and types, from an 18hh heavyweight hunter, down to a diminutive Dartmoor lead-reign, entered the Castle Arena for the judging of the Royal Windsor Supreme Ridden Showing Championship sponsored by Dodson & Horrell. Judged by Olympic Dressage supremo, Richard Davison, and international Show Jumper, William Funnell, tension mounted as competitors entered the arena for the last time, with some horses clearly over-awed by the building atmosphere. Annabelle Jewks’ Diamonds Are Forever, ridden by Allister Hood to be crowned Champion Riding Horse earlier in the week, followed close in second to take the Reserve Champion title. Elsewhere, the Final of the DAKS Pony Club Mounted Games saw victory go to the young England team, with the Shetland Pony Grand National sponsored by Sandra and Martin Wood was won by Harry Barker, the grandson of legendary commentator Mike Tucker. Royal Windsor Horse Show is honoured to announce that 2016 Olympic Individual Gold Medallist, Nick Skelton, has chosen to officially retire, along with his Olympic horse Big Star, at Royal Windsor Horse Show on Sunday 14 May 2017. Big Star, owned by Gary & Beverley Widdowson, has been partnered by Skelton since he was bought as a five-year-old. Big Star has helped Skelton to win two Olympic Gold Medals, numerous major Grand Prix titles and consistently delivered clear rounds for Great Britain in Nations Cup competitions. The fourteen-year-old stallion will be officially retired on the Sunday of Royal Windsor Horse Show in the Castle Arena in front of HM The Queen. Royal Windsor Horse Show Show Director, Simon Brooks-Ward, spoke of the decision. 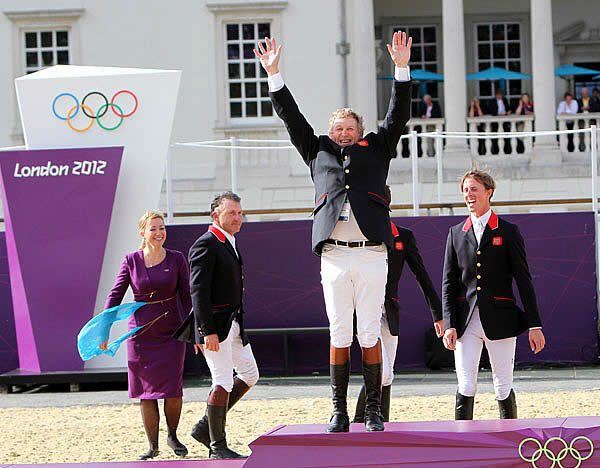 “Nick Skelton is not only a legend of equestrian sport but of the whole sporting world. What he has achieved in his career is remarkable and we are honoured he has chosen Royal Windsor Horse Show as the place to officially retire along with Big Star. Tickets can be purchased at www.rwhs.co.uk or by telephoning the box office on 0844 581 4960 from the UK and +44 (0) 121 796 6290 internationally. Tickets also available locally at Windsor Information Centre either over the counter or by telephoning +44 (0) 1753 743907. Organisers of Olympia, the London International Horse Show, are delighted to announce that double Olympic gold medal winning duo, Nick Skelton OBE and Big Star, will be competing at the Show this December. The combination, part of the gold medal winning Show Jumping team in London, 2012, and individual gold medallists in Rio, will be making a rare UK competitive appearance, giving home fans the opportunity to witness their brilliance first-hand. Earlier this year, at the age of 58, Nick became Britain’s second-oldest Olympic gold medallist, in what was his seventh Olympic Games. On Thursday afternoon 15 December, the audience will be treated to a live Q&A session with the Olympic star which will take place in the arena. Members of the public will have the opportunity to submit their questions ahead of the event by filling in an application form on the Show website. The news comes on the back of the announcement that triple gold medallist Valegro, the superstar of the Dressage world, will also be present at Olympia, as he bows out of the sport on a high in an official retirement ceremony, on Wednesday 14 December. Tokyo (JPN), 22 November 2016 – Rio 2016 Olympic Jumping champion Nick Skelton (GBR) added another major accolade to his collection when he was declared the winner of the top prize at the prestigious 2016 FEI Awards gala dinner in Tokyo (JPN), in the presence of guest of honour, FEI Honorary President, HRH Princess Haya. Longines’ Vice President and Head of International Marketing Juan-Carlos Capelli, who presented the Longines Rising Star award during the ceremony, said: “It is my great pleasure to be here this evening and to be a part of the FEI Awards’ celebration of these great equestrian heroes. As we have seen here tonight, all of the winners have shown what hard work and dedication are all about. They are champions that we can be very proud of. Nick Skelton (GBR) riding Big Star, Rolex Grand Prix, CHIO Aachen 2013 © Rolex/Kit Houghton. 30 June 2013 – Aachen, Germany – Nick Skelton (GBR) today proved that things really do get better with age when he won the Rolex Grand Prix at CHIO Aachen and thereby becomes the first ‘live’ contender for the Rolex Grand Slam of Show Jumping in 2013. Riding his favourite horse Big Star, Skelton was one of only three riders who went double clear in the first two rounds, and he then topped off a stunning afternoon of Show Jumping with a clear, quick round in the jump-off, beating the 26-year-old Swiss rider Janika Sprunger riding Palloubet d’Halong into second place, and Patrice Delaveau (FRA) on Orient Express HDC into third. Daniel Deusser, riding Cornet d’Amour, was the leading German rider in fourth place, and unlucky to have a time fault in the first round, his only penalty over two rounds of jumping. This is Skelton’s fourth victory in the Rolex Grand Prix at CHIO Aachen and makes him the most successful rider to compete in the highlight of the famous World Equestrian Festival. His first title was over 30 years ago in 1982 when riding Everest If Ever, and he has had subsequent victories in 1987 and 1988 riding Raffles Apollo. Forty horse and rider combinations qualified for the Rolex Grand Prix, and the first round saw eight go clear. The format of the competition dictates that numbers reduce to 18 for the second round, and faults are carried forward. The second round saw eight of the eighteen go clear including successful rounds from Rolex Testimonees Meredith Michaels-Beerbaum (GER) on Bella Donna and Steve Guerdat (SUI) on Nino des Buissonnets, but only three went through to the jump off which was won so emphatically by Nick Skelton. The Rolex Grand Slam of Show Jumping features three of the world’s greatest equestrian shows – the CHIO Aachen, the CSIO Spruce Meadows ‘Masters’ Tournament and CHI Geneva – and is the first global initiative to reward the outstanding rider who wins the Grand Prix at each show in succession. The winner of the Rolex Grand Slam of Show Jumping will be rewarded with a €1 million bonus prize. The rules of the Rolex Grand Slam of Show Jumping are simple: any rider that wins the Grand Prix at each of the three shows consecutively will receive €1m on top of the prize-money for each show’s Grand Prix. Moreover, any rider that wins two out of the three shows’ Grands Prix will also receive a bonus. If the Grands Prix at two shows are won in succession, the bonus will be €500,000. If a rider is successful in qualifying for the “two out of three mode”, but doesn’t claim the victories at two consecutive shows’ Grands Prix, the bonus will be €250,000. It is only the rider that counts, not the horse, i.e. it is possible to claim the bonus riding different horses. This system is infinite; it is not limited to a calendar year. Wellington, FL – January 30, 2013 – The fourth week of competition at the 2013 FTI Consulting Winter Equestrian Festival (FTI WEF) began on Wednesday, January 30, with a win for Olympic gold medalist Nick Skelton (GBR) and his mount Heracross in the $8,000 G&C Farm 1.45m speed class. Week four, sponsored by Fidelity Investments, will run January 30 – February 3. The week will feature the $33,000 Ruby et Violette WEF Challenge Cup Round 4 on Thursday afternoon, the $100,000 Fidelity Investments CSI 2* Grand Prix on Saturday evening, and the $25,000 Suncast 1.50m Championship Jumper Classic on Sunday afternoon. The 2013 FTI Consulting Winter Equestrian Festival features 12 weeks of competition running from January 9 – March 31, 2013, and will be awarding almost $7 million in prize money throughout the circuit. Nick Skelton earned his first victory of the 2013 winter circuit in Wednesday’s $8,000 G&C Farm 1.45m class jumping a speed track set by Olympic course designer Leopoldo Palacios (VEN). Twenty-four entries started the class and 15 completed the course without fault. The fastest time of 58.655 seconds laid down by Skelton and Heracross earned top honors. Special Chance to Ride with Nick Skelton at the Great Charity Challenge! 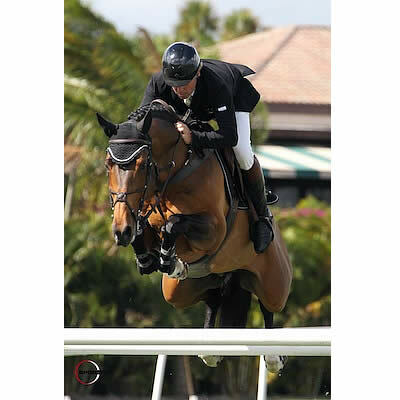 Wellington, FL – January 23, 2013 – Be a part of Olympic Gold Medalist Nick Skelton’s newly added team for the FTI Consulting Great Charity Challenge presented by Fidelity Investments (FTI GCC) on Saturday, January 26, 2013. This is a chance to ride in an historic event with the highest purse in show jumping. Two amateurs or juniors have the opportunity to join in the spirit of giving and compete on behalf of one of 34 Palm Beach County charities to win part of $1.5 million dollars. Two spots are open on Nick Skelton’s team – one rider to compete at the 1.10m level and a second rider to compete at the 1.20m level in a relay race on Saturday evening. For a tax deductible donation of $10,000 to the Fidelity Charitable Gift Fund, the new team member will have the thrilling opportunity to ride side by side with one of show jumping’s greatest riders while contributing to a worthy cause in one of the FTI Consulting Winter Equestrian Festival’s proudest moments. Riders will have this chance on a first come, first served basis at each level of 1.10m and 1.20m. Please contact Anne Caroline Valtin at 561-784-1133 to sign up for this team! Nick Skelton, Great Britain’s Olympic team gold medalist and one of the icons of jumping, on Friday joined American hunter, jumper and dressage riders in speaking out against attacks on equestrian events at Wellington, Florida, where he has been one of the most successful riders in recent years. “I think people, especially those who are in the sport, want to be careful how much they try and stop the horse shows in Wellington,” he told dressage-news.com from the CSI5* Paris Masters. “Investment in recent years has made it a great facility, probably the best in the world. The comments by Nick came after the Jacobs family, which opposes equestrian events at Palm Beach International Equestrian Center’s Stadium complex, filed a new lawsuit to prevent several 2013 Winter Equestrian Festival hunter and jumper competitions and wiping out the entire Global Dressage Festival.